Published by Fr. Murphy on Wednesday, January 24, 2007 at 1:46 PM. You may be a camposino if the above image makes you hungry. If you have a loose connection on your car battery and the first thing you grab to tighten it is a rock, you might be a camposino. If because of an approaching rainstorm you flag down a ride from a pick up with vacant seats inside and you jump in the open back bed, you might be a camposino. Published by Fr. Murphy on at 1:40 PM. This is how our local bishop, Msgr. Grullón, spent his 65th birthday. How are you spending your golden years? We visited 6 districts of the parish in 5 days, one day and night was spent returning. We had 37 Confirmations, and participated in hours of meetings about the progress of each of our 25 locales. The best news to report from the Loma is that the bishop is finally caving in to good economic sense. The road he has labored to install so that the foto of him on mule back wouldn’t be so common a sight is one that is supported entirely on generous donations. Well, the road nearly made it to the goal last year, but, unfortunately, all that progress was of little use to us this trip because of the great washouts from the rainy season. Fortunately, this has inspired a change of planes on the bishop’s part. His Excellency is now laying out a plan that will benefit the people in multiple ways. He wants to install a toll. Not that the average traffic on foot, mule, motorcycle or even pickup truck will pay anything, but he wants to charge the big trucks that make their way to the various markets and pick up produce on the side of the road. He has a different rate depending on what these truckers are hauling and he is including the local national guard post to assist the toll team in their collections. The folks will benefit from being able to maintain a road that not only makes life easier, but also supports and encourages an economy. Best of all, they will be able to do this themselves without constant handholding from the diocese or some other big institution. Interesting anecdote from my mountain folks: When we arrived at our furthest destination, Sierrecita (Where the road ends). I noticed that the house that is nearest the chapel with the family that usually does our cooking was vacant. This is a sizable house by local standards, all wood with a raised non-dirt floor. When I inquired of the whereabouts of the residents with our coordinator of the community, he informed me that they are bunking down with him because…the house is haunted. Well, I didn’t let this pastoral moment slip by. I told them right away the reason for this haunting—they refused marriage in the Church when offered. I don’t remember this from classes in Rome regarding the sacrament of Marriage, but surely if a family doesn’t invite Christ to be the foundation of their family they are only opening themselves up to trouble. My demonology aside, I don’t think I know many people States-side who would open their 2 bedroom home to neighbors with 5 children because the family was claiming something spooky was going on in their own house. Published by frgee on Monday, January 22, 2007 at 6:02 PM. EDIT: i couldn't stand the red, white, and black. i've switched to this for the time being. Published by frgee on Thursday, January 11, 2007 at 12:11 PM. sorry for the slight delay in posting times, we just finished the annual pastoral visit with bishop grullon. we had the honor of attending the first ever deaconal ordination in the newly restored cathedral in san juan. also, we were particularly honored because the man who was ordained is from our parish. 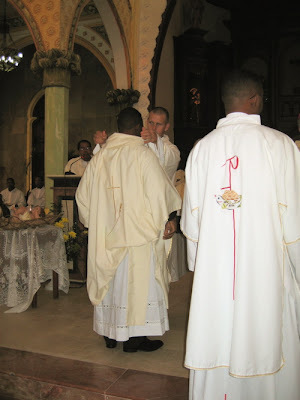 pedro (from pilon, a 2 hour walk from banica which he made every day to attend high school) is an outstanding young man who will, with the grace of God, be ordained a priest here in banica this summer. 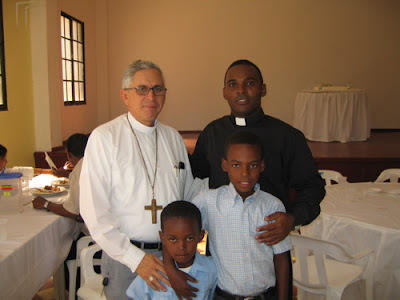 below you will see a picture of me vesting him and another of pedro and the bishop after the Mass. also, please pray for me as i begin my yearly retreat on sunday. 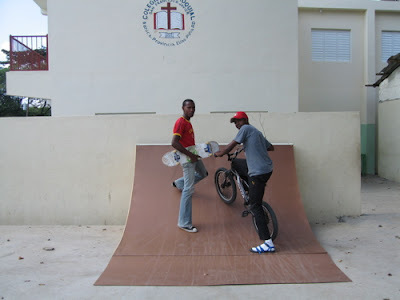 i will not be posting until after my retreat, and hopefully, when i do, it will be with a new blog format...also, the quarter-pipe is too small, a half-pipe is in the works and should be completed sometime in the first week of feb. Published by Fr. Murphy on Sunday, January 07, 2007 at 11:31 AM. Let it be known that the “we” in the previous blog had nothing to do with me. I’m just thankful that good ole USA style litigation hasn’t caught on here. The mission continues to hold a few surprises. I had a major startle this weekend as I was tending to the good folks of Rincon (2 ½ hour drive from here). I hadn’t yet walked into the chapel when a man accosted me. I had to ask him to repeat what he said, not because the Spanish was indiscernible, but because it was unbelievable. He asked me if I was going to hear confessions. He then, proceeded to lecture the tiny congregation of the need to confess before the beginning of the new year. I heard 5 confessions which is more than half of what I heard in town during Advent. The other startle in my trip to the Loma was to awake in a chapel to find a tarantula not more than 5 feet from my head. Interestingly, it was a greater shock for me that when during the same trip I tossed an unwrapped Power Bar in the path of a scavenging pig and she turned her nose up to it. Speaking of turning one’s nose up, there is a gourd down here called auyama. This vegetable has been called (by Fr. Gee) a fruit of Original Sin. Imagine an acorn squash, yet larger, with little flavor and extremely dry (at least, as customarily prepared). And as Murphy’s Law would have it, it would have to be one of the more popular dishes in the Loma. One the greatest signs yet of my progress in getting acclimated, was that last Saturday it was all I was offered for lunch and I ate it with only slight feelings of gagging. The gourd has potential, but is unanswerably missing something very important. Published by frgee on Monday, January 01, 2007 at 4:08 PM.